Pall-bearers carrying the coffin after the funeral service. Irene (fourth left) and her five children. 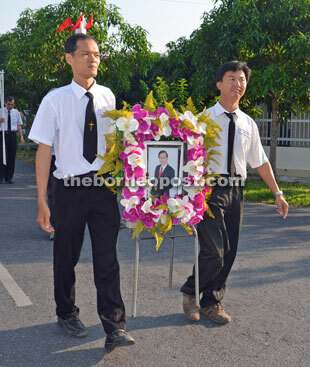 Two church members carry Ho Leng’s garlanded portrait. Hundreds of people including family members, friends, DAP party leaders and supporters participate in the procession to the church. The coffin arriving at the church. 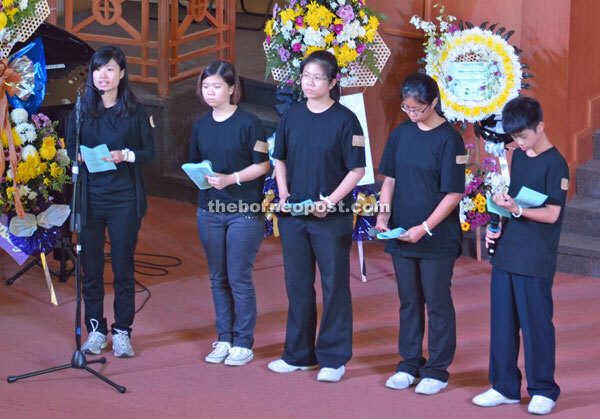 (From left) Suzanne, Julie, Victoria, Brenda and Gabriel sing hymns for their father. 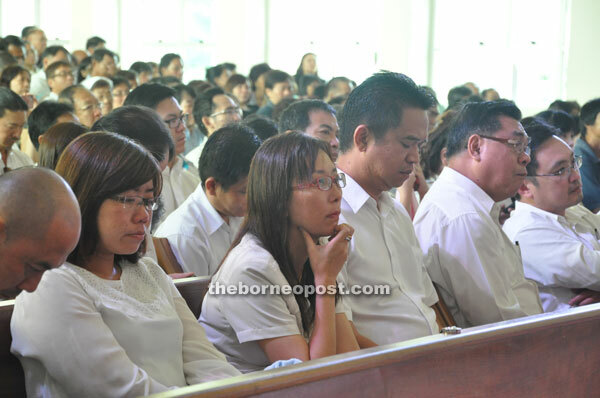 Among the DAP elected representatives attending the funeral service are (from left) Batu Kawah assemblywoman Christina Chiew, Teresa Kok, Kidurong assemblyman Chiew Chiu Sing (second right) and Chong (right). Guan Eng (second left) and Kit Siang console Irene during the funeral service. 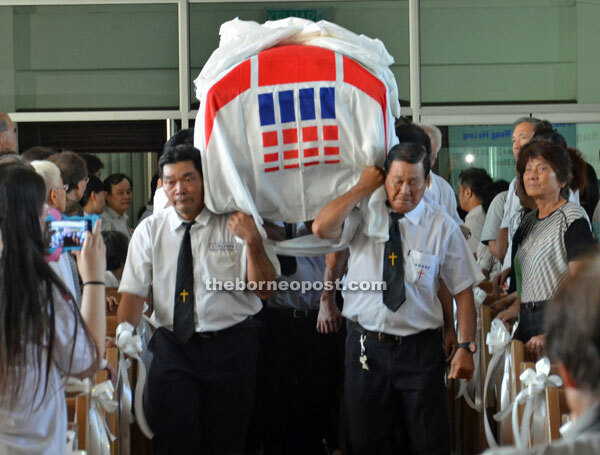 SIBU: Bukit Assek assemblyman Richard Wong Ho Leng was laid to rest at the Methodist Cemetery at Mile 10, Oya Road here yesterday morning following a funeral service at Hwai Ang Methodist Church. Earlier, around 7am, hundreds of relatives, friends, party comrades and business associates joined his family members at the en-coffin ceremony at his residence in Ipoh Road followed by a procession from the house to the church for the funeral service. 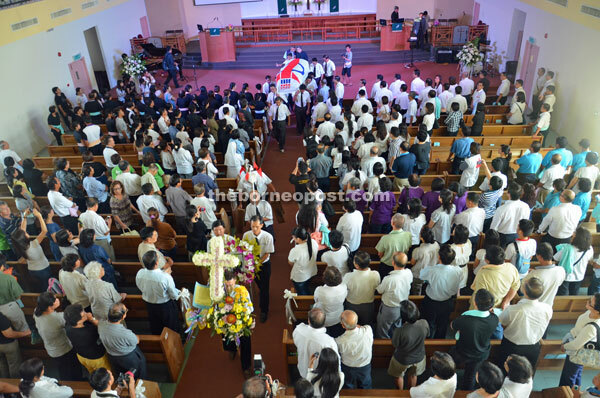 In his eulogy at the church service, Penang Chief Minister Lim Guan Eng said Ho Leng had started as a giant killer in the state’s politics and ended as a political giant. 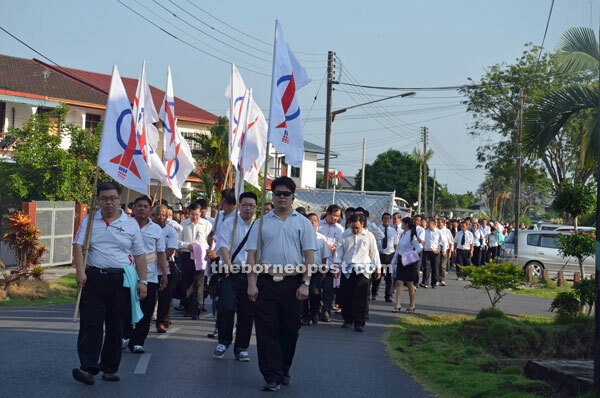 Ho Leng, he said, joined DAP on April 19, 1986 with the desire to serve the community and his state. “DAP Sarawak has remained in existence because of Ho Leng. “Throughout his political life, he not only brought up young leaders in DAP but he changed Sarawak’s political landscape,” Guan Eng noted. He said Ho Leng would be remembered for changing the lives of people around him for the better — people in Sibu in particular and Sarawak in general. Ho Leng’s eldest daughter Suzanne described her father as a great man who had lived by the principle of putting other’s need before his own. “Despite his hectic life at work, he had always made it a point to spend time with the family when he came home,” she recalled. Ho Leng died at 10.50pm on June 21 at Rajang Medical Centre here after an 18-month battle with brain cancer. He leaves behind wife Irene Chang, son Gabriel and four daughters — Suzanne, Julie, Victoria and Brenda. 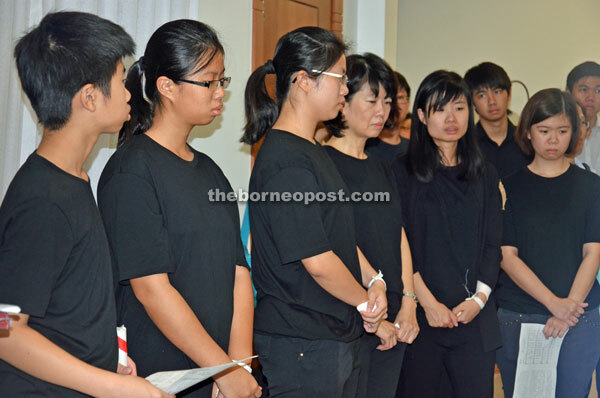 Among those at the funeral service were DAP national advisor Lim Kit Siang, vice-chairperson Teresa Kok, DAP, Sarawak chairman Chong Chieng Jen, PKR Sarawak vice-chairman See Chee How and other DAP leaders.